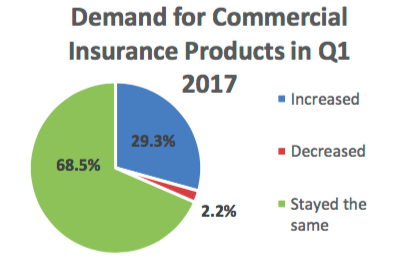 Demand for commercial insurance continued to follow a slight upward trend in the first three months of 2017, according to the latest Council of Insurance Agents & Brokers’ Commercial P/C Market Survey. A large number of brokers reported an increase in demand for cyber coverage as clients became more familiar with the product and more interested in purchasing stand-alone policies. 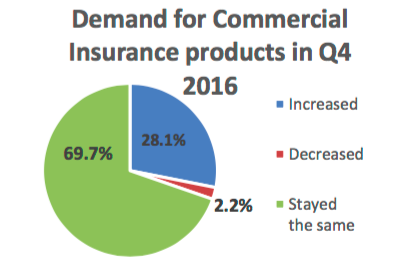 The majority of brokers, 68.5 percent, reported that demand for commercial insurance products stayed the same in the first quarter of 2017, compared to the fourth quarter of 2016. Nearly 30 percent of broker responses saw an increase in demand, while only 2.2 percent saw a decrease. As for pricing, the soft market continued in Q1 2017, with the average rate decline across all commercial P/C accounts at 2.5 percent, compared to 3.3 percent in Q4 2016. This is the ninth straight quarter that commercial rates have declined across small, medium and large accounts, The Council said. Additional I.I.I. facts and statistics on the commercial lines insurance market are available here.